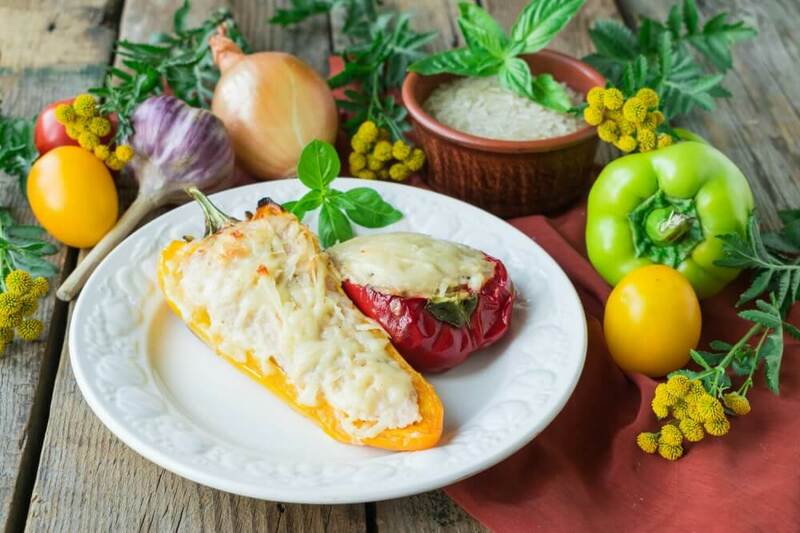 Today I want to present you a variation of the classic recipe for stuffed peppers with meat and rice. 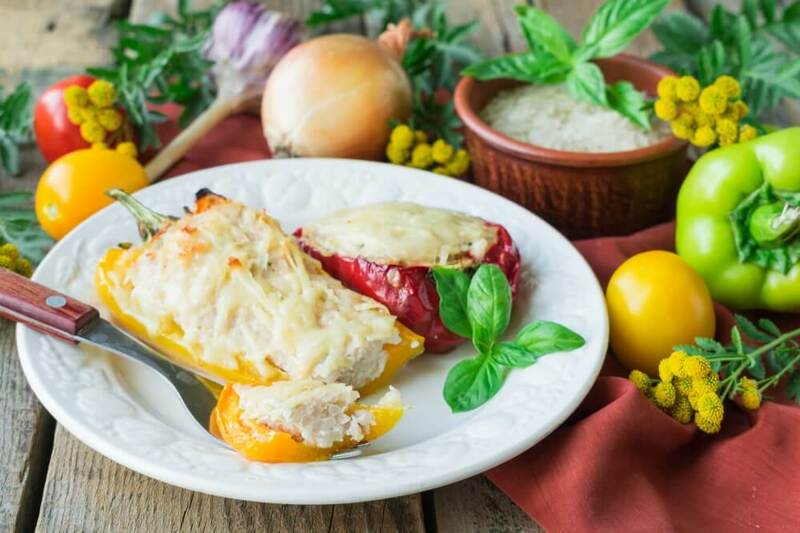 Cut the pepper half, fill with the minced chicken and bake under the cheese crust in the oven. Chicken fillet stuffing turns out very tasty, tender and soaked with vegetable juice during baking. At the same time, the taste of the pepper itself is significantly different from that which is stewed in tomato sauce. Baked pepper turns out very fragrant and gives this dish a unique flavor. 1. 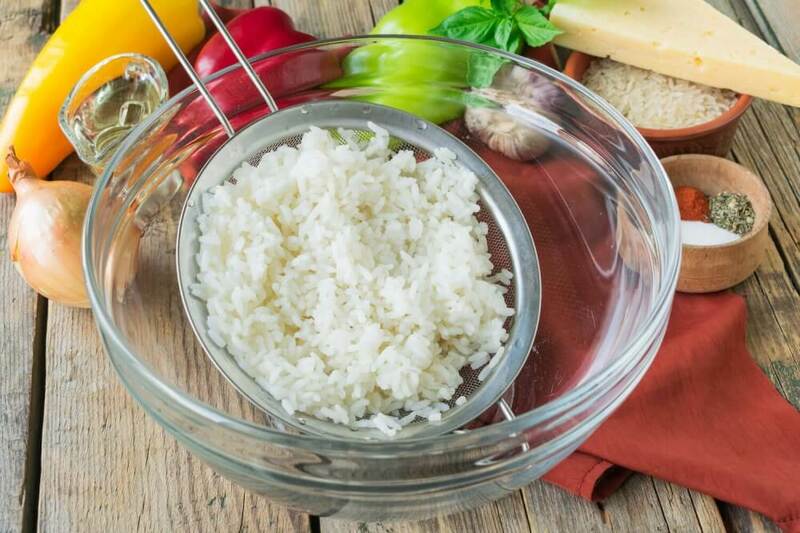 Thoroughly rinse rice under running water. Put the cereal in a saucepan, fill it with plenty of cold water and set it on fire. When the water boils, add a little salt and continue cooking the rice over low heat until half cooked. Then fold the rice into a sieve and dry to room temperature. 2. Wash the chicken fillet, clean it from films and cut it pieces of medium size. 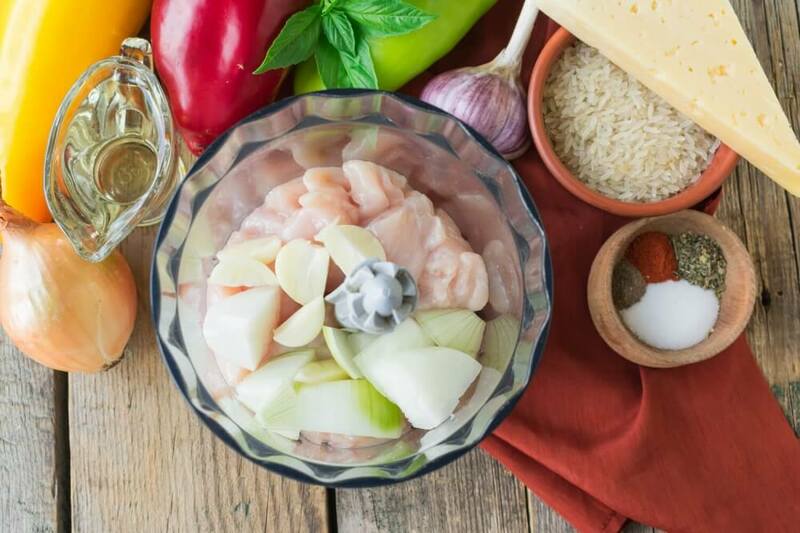 Put the chopped meat in the bowl of a blender. Add peeled and cut half cloves of garlic and one onion head that is cut several pieces. 3. Chop the chicken fillet with onions and garlic in a uniform thick stuffing. Add the minced meat in a bowl with boiled rice. Salt and season the mixture with ground spices. For flavor add finely chopped leaves of fresh basil. 4. Thoroughly mix the minced chicken with rice and spices, achieving a uniform consistency. Wash bell pepper and cut half. Carefully cut out the seed box, taking care not to damage the vegetables. 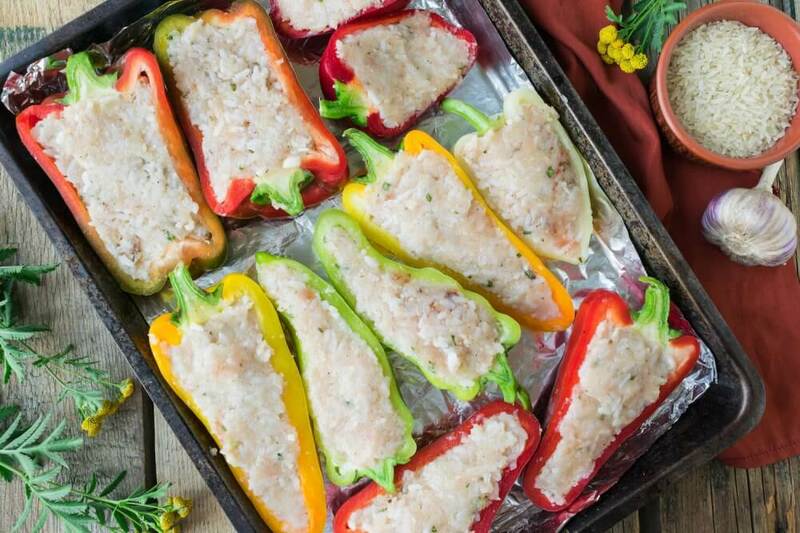 Fill the halves of sweet pepper with ready stuffing of chicken fillet and rice. Cover baking tray for cooking with food foil, sprinkle with vegetable oil. Lay out our preparations on the prepared baking sheet. 5. Put the stuffed pepper to the oven heated to 200 degrees for 20-25 minutes. 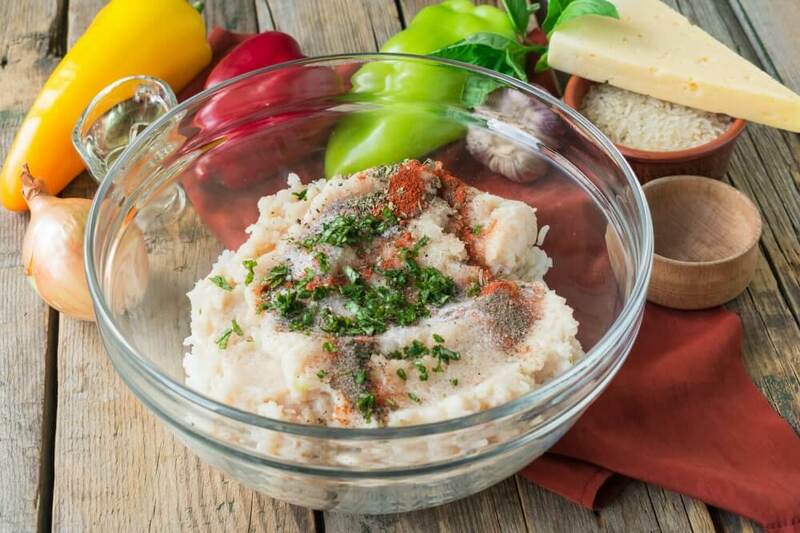 The exact cooking time depends on the size of the sweet pepper and the characteristics of your oven. Then gently remove the stuffed pepper from the oven. 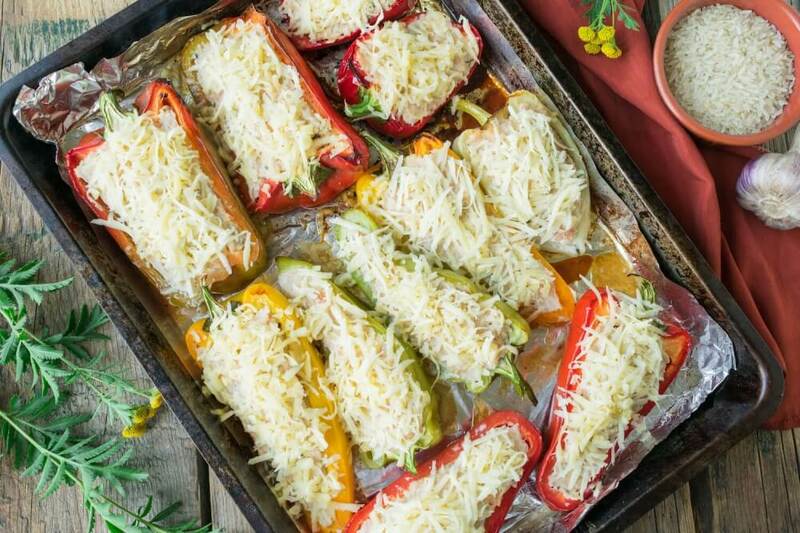 Sprinkle halves of pepper with grated hard cheese. Put the baking sheet to the oven for another 5-7 minutes to melt and brown the cheese. 6. 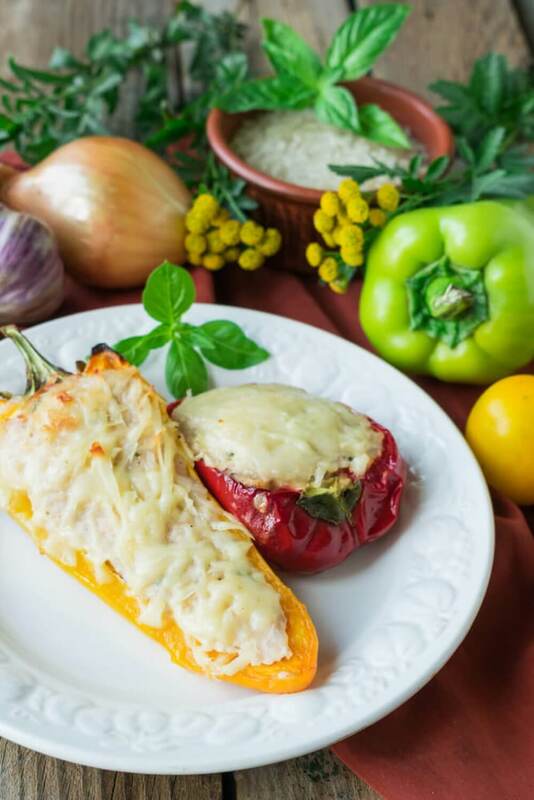 Serve ready stuffed peppers hot as a main course.